Eczema in babies is relatively common in Western nations, affecting 1 in 10 infants. It can be particularly frustrating for parents when it occurs in newborns. In addition to a crying baby who cannot effectively communicate their needs, colic and other newborn quirks, the eczema can make caring and calming a baby a very difficult task. Fortunately many children outgrow eczema. It can be effectively managed even in the early months of life. With a combination of education about eczema and the treatment from a paediatrician or dermatologist who is well versed with infantile eczema, the condition may not necessarily be as troublesome for both baby and parents. 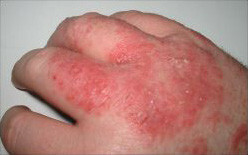 Eczema simply refers to any skin condition but particularly atopic dermatitis. Infantile eczema therefore primarily refers to atopic dermatitis in babies. It occurs within the first 5 years of life but can occur as early as two months of age. It should not be confused with seborrheic dermatitis in infants which is also known as cradle cap and can also contribute to persistent nappy rash. Contrary to popular belief, eczema is not always an allergy issue solely. However, atopy is associated with other allergic conditions like allergic asthma and allergic rhinitis. Infantile eczema can be very distressing to both babies and parents but it is not life-threatening. Many children outgrow the condition after several years but in some instances it can persist into adulthood with occasional flare-ups. Proper treatment is essential as there is a risk of secondary bacterial infections of the skin, among other complications. This type of infection can be very serious and even become life-threatening if not managed properly. Therefore infantile eczema should not be left untreated. What causes eczema in newborns and babies? The exact reason why eczema occurs in infants is not known. However, it is not always just a matter of allergies. An allergy is the body’s reaction to an otherwise harmless substance (allergen). The immune system incorrectly identifies the allergen as a threat and reacts to it. This causes inflammation in certain organs like the skin (eczema), airways (asthma) or nasal and sinus linings (allergic rhinitis). The vast majority of eczema cases are due to a hyperallergic state known as atopy. This tends to run in families thereby indicating a genetic factor. These children may therefore also develop asthma or allergic rhinitis. In an allergy the inflammatory processes occurs at the a specific point in the body thereby leading to the symptoms seen in each allergic condition. But there appears to be more to the issue of infantile eczema than just allergies. Children with eczema seem have less ceramides in the skin. These are fatty substances found within the cell membranes. It helps to form a barrier and protect the skin against water loss and excessive drying. When the ceramide levels in the skin are low, the skin can then lose water easily and become excessively dry which is a hallmark of infantile eczema. 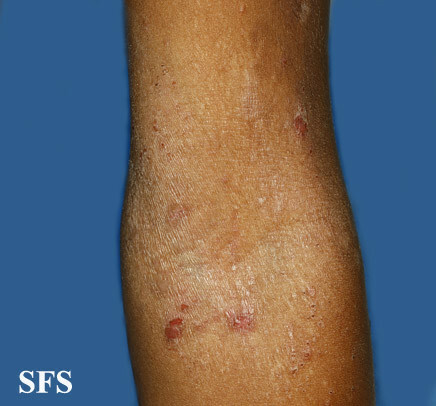 The skin is then compromised and prone to injury and infections. There appears to be a strong link with hereditary factors possibly indicating a genetic component. Although the exact reason why infantile eczema affects some babies and not others is unclear, there are many trigger factors that have been identified. Trigger factors initiate or exacerbate the changes in the skin but do not cause the condition. Instead the cause may lie in the dysfunction of the immune system (allergies) or lack of ceramides in the skin, which in turn originates from genetic factors and possibly other factors that are not fully understood. There are number of possible allergens in and around the home. Many of these are airborne and are either inhaled or make direct contact with the skin. However, it appears ingested allergens (food and drink) may also play a role. This can include dairy, nuts, egg yolk, wheat and other foods. Different textiles may worsen eczema in children. Wool is one of the problem fabrics but many synthetic textiles may also be an issue. Another factor to consider with clothing is the laundry detergent used for washing. Some may be more of an irritant than others. Perfumes, soaps and creams may also irritate the skin. Strongly scented soaps and creams are generally more of an irritant. Any other skin application that appears to worsen the condition should be avoided. Dry air is by far one of the major climatic irritants, irrespective of whether the weather is warm or cold. Heat and humidity tends to also irritate the skin. The baby’s own sweat may be a problem and therefore baby should be kept cool to prevent excessive sweating. The presentation of eczema does vary slightly among babies and older children. It is usually the area where it tends to appear or be worse that differs. Typically the skin is dry and rough. 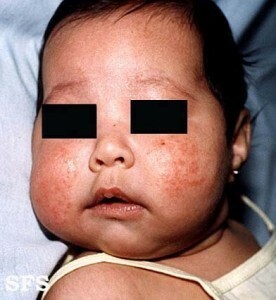 Redness is more prominent among babies and sometimes it can be weeping lesions. Pus usually indicates a bacterial infection. In newborn babies and within the first year of life, eczema often presents on the cheeks and may also be present on other parts of the face. It can extend down the neck and also affect the nappy region. The arms and legs may also be involved. As the baby gets older, usually after 18 months of age, the skin rash is usually confined to the skin folds particularly at the joints. This may include behind the knees, wrists, elbows, neck and sometimes the ankles. 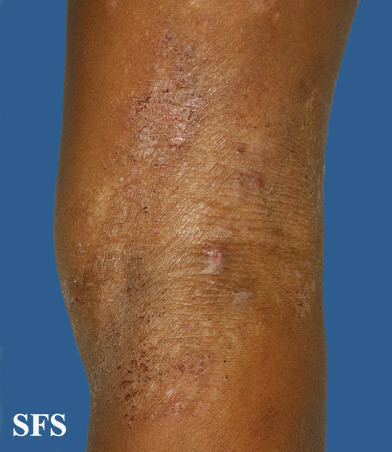 The skin may become thicker later on and form deep distinct lines. 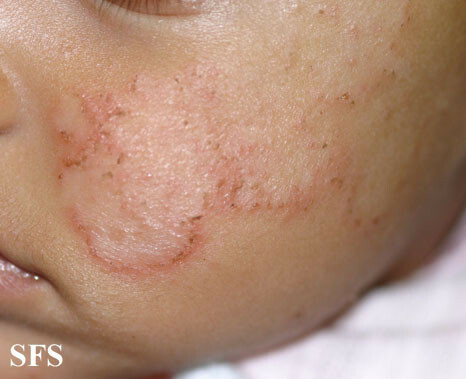 Some children continue to experience eczema on the face, even after 2 years of age. It may be more focused around the mouth and eyelids. A red scaly rash with yellow crusting is more often seborrheic dermatitis than infantile eczema. Seborrheic dermatitis tends to occur on the scalp, forehead, behind the ears, eyebrows and eyelids. Itching is a very prominent symptom of eczema. Scratching excessively often causes tiny tears in the skin and sometimes bleeding. While babies older than 6 months may make some effort to reach out to the itching area, younger infants usually cannot do so. Often infants may cry incessantly despite being fed, having a clean nappy and consoled by caregivers.